Acoustic welding, and more particularly ultrasonic welding, has become increasingly popular in a number of industries. For example, businesses in the textile and personal products industries often manufacture products such as diapers, clothing, etc., that are ultrasonically welded. Ultrasonic welding tools operate under the principle of applying acoustic energy in the ultrasonic frequency range (i.e., at or above 20 kHz) to a horn. The horn vibrates in response to the applied acoustic energy to further produce an output acoustic energy. The output acoustic energy is applied to the materials (typically thermoplastics) being joined by positioning the horn in the vicinity of the parts. The vibrational energy travels through the parts, and at the interface between the parts, is converted to heat. The conversion is due to intermolecular friction that melts and fuses the parts together. While a number of horn configurations have been developed, it is well known that a good way to attain high quality and high speed ultrasonic welds is to use a rotary horn with a rotating anvil. Typically, a rotary horn is cylindrical and rotates around an axis. The input acoustic energy is in the axial direction and the output acoustic energy is in the radial direction. The horn and anvil are essentially two cylinders positioned close to each other, rotating in opposite directions with equal or nonequal tangential velocities. The parts to be bonded pass between these cylindrical surfaces at a linear velocity which usually matches the tangential velocity of these cylindrical surfaces. Matching the tangential velocities of the rotary horn and the anvil with the linear velocity of the parts can minimize the drag between the horn and the parts. 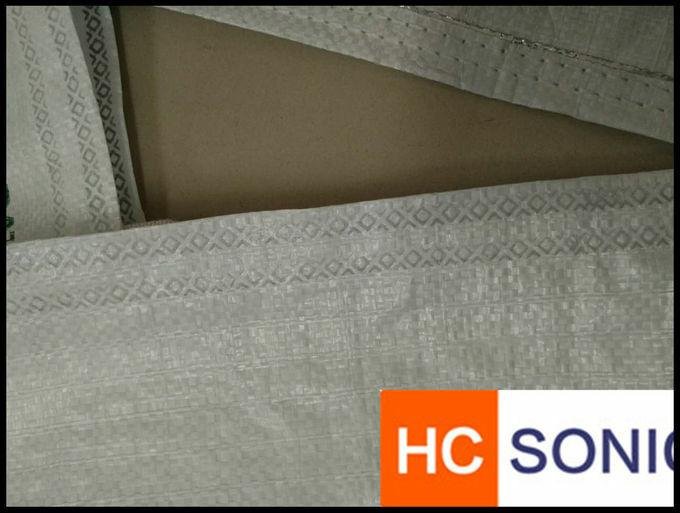 Ultrasonics is also the method of choice for these materials, for example for parting fabrics so that there is no thickening of the material along the cut edges. No consumables such as glue, staples or sewing thread are needed. The fabric remains intact, because no external thermal energy is directed into the fleece. Position, shape and displacement of the welding points can even support the desired properties of the composite. Textiles is thus a field where ultrasonic technology can prove its uniqueness. 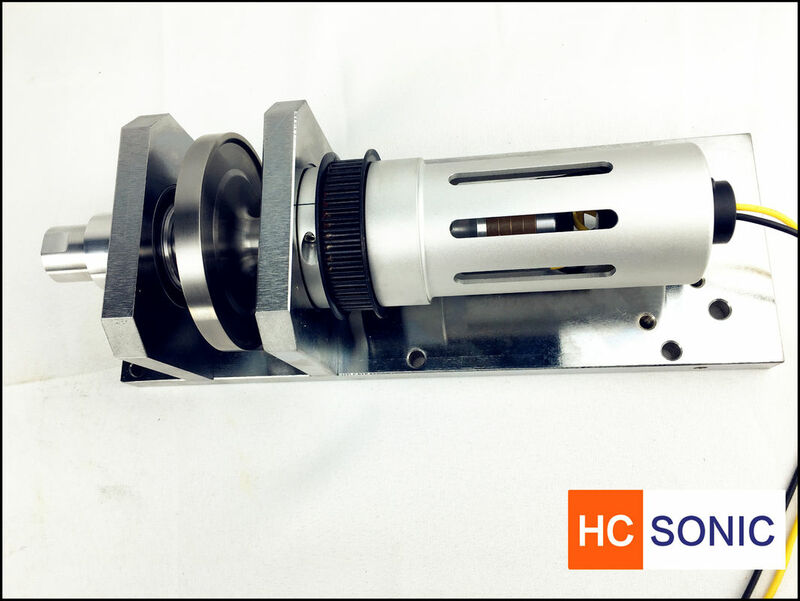 HC-SONIC specializes in manufacturing ultrasonic seam welding solutions for rotational systems. Numerous seam soldering devices have been developed over the past years. From sonotrodes that can be installed in automated assembly lines, the Elmrt35 ultrasounds sewing machine up to customizations such as the PFW model devised for continuous welding of pleated filters. There are two types of rotating modules for these operations: with either a side or central sonotrode resonating at a 35 kHz frequency and power varying from 600W to 1200W. These horns can be made out of aluminium, treated with a special surface strengthening procedure, or titanium. Our seam welding solutions are employed in binding synthetic textiles such as PVC, polyester, polypropylene, coated, filtering and technical fabrics. Special length, please inform us. An ultrasonic sewing machine is versatile and easy to use in order to seam, cut, slit, trim, tack, emboss, or to cut and seal at the same time. The process used by every ultrasonic sewing machine is fast, simple and efficient. It can seal up to 80 meters per minute without the need for threads nor needles. It is indeed a flexible technology. Due to the adaptability of its design, it is possible to mount the sewing machine on a workbench or to install it into semi or fully automated systems. Instead of needles, thread, glues or other adhesives, ultrasonic sewing equipment uses a patented rotary system, coupled with high-frequency vibrations, to bond synthetic or blended materials containing up to 40 percent natural fibers.